There is a saying in Boulder, Co., known as Niwot’s Curse—to the effect that the beauty of the place, the gentle weather and soaring rocks, would draw people in and those people would destroy the beauty that drew them. The curse’s namesake was a peaceable Arapaho chief who died of wounds suffered in the 1864 Sand Creek Massacre, conducted by an especially genocidal militia of white settlers. Boulder’s present residents interpret his words in a variety of ways. For some, especially the older-timers, it’s a rebuke against the plentiful newcomers fleeing the coasts, along with the traffic and construction projects they bring. For those newcomers, it evokes the discovery that, here in flyover country, the cost of living turns out to be no lower than back on the coasts. And thus the curse is also a hypocrisy, one familiar among liberal utopias: the storied counterculture and inclusivity that attract so many new settlers, along with the beauty, seem to have priced out any inclusive countercultures to come. Part of any curse is the curse of forever trying to lift it, and after protracted strife the city has arrived at its latest means of doing so. After midnight early Wednesday morning, the city council passed a measure that enables housing cooperatives to form in Boulder’s neighborhoods. Soon after I moved to Boulder to assume a teaching post in the summer of 2015, I first saw the curse at work. It was at a city council meeting, where the subject of debate was an occupancy limit that prevents more than three or four unrelated people from sharing a single house—in particular, whether to start actually, more aggressively, enforcing it. Angry neighbors, especially from around the student ghetto of University Hill, called for a crackdown. But far outnumbering them was an organized bloc of mainly young, illicit over-occupants, together with allies from the three legal co-op houses. It was a statement about family. A family of two grandparents, two parents and six grandkids could, by right of law, share a house that ten people unconnected by blood could not—even if they considered their housemates their family, even if their biological families turned them out, as had happened to several speakers that night, generally on account of their confessed gender identities. This was a claim to the right of intentional community, the right that so many cenobites, artist colonies, friends and co-workers throughout history have shared. Those words rebuked the regime of detached houses with yards and strip malls, which James Howard Kunstler has suggested make America less “worth defending,” which disgusted the Egyptian visitor Sayyid Qutb, later a seminal leader in the Muslim Brotherhood, when he lived two hours north in Greeley in 1949. This system of thought requires each person or couple to consistently earn the money sufficient for a house, a car or two, a lawn, however many batches of childcare and higher education they dare to commit themselves to through procreation, and so on. The cooperators, in contrast, shared their calculations of how drastically their electric, gas and water consumption pale in comparison to the average Coloradan. As I listened I remembered the stories of an old friend (we met in a housing co-op in college) who grew up in the Boulder of another era, raised by the members of his family’s Marxist commune. 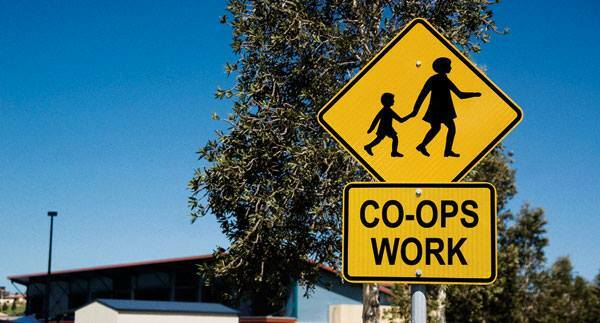 The subject of that 2015 city council meeting wasn’t co-ops, but already the comments from the bloc were beginning to coalesce around co-ops as a solution to the enforcement dilemma. The council, they proposed, could create a pathway to legalization for those affordable, over-occupied homes by enabling them to become bona-fide, above-ground, registered cooperatives, governed and in many cases owned by their residents. (This would mean replacing an existing, decades-old co-op ordinance so cumbersome that the only legal co-ops had to be formed as exceptions to it.) By injecting the mutual and community responsibility that cooperative principles require, perhaps the over-occupiers could stem the fears of the status-quo partisans. Boulder would get a cheap and bottom-up way of creating the affordable housing that had otherwise been so elusive. And so, for the next year and a half, I watched from a cautious newcomer’s distance as a remarkable swell of organizing took place, a tireless campaign of persuasion. A group of cooperators, under the aegis of the Boulder Community Housing Association, mobilized. Neighbors supported them, and packs of retirees, longing for co-ops of their own, joined the cause, too. Together they drafted ordinance proposals, held public events, helped elect some friendly city-council candidates, kept saturating council meetings, concocted social-media memes, saturated more meetings, collected public data into statistical models and graphs, wrote letters, got their friends to write letters, got me to write letters, invited council members over for visits, and sometimes rested—all the stuff you’re supposed to do in democracy. Those opposed were a fierce and steely bunch of homeowners, the Boulder Neighborhood Alliance, intent on preserving their town more or less as-was forever, despite its actual residents. They took out ads demonizing the young and tried to get some of the illegal co-ops evicted. People lost their homes. A new friend of mine did. Yet the democracy seemed to be working, its story spreading. At the International Summit of Cooperatives in Quebec, I met the head of the Canadian co-op housing association, and when he heard where I was from he asked about the effort, knowingly, and wanted to know how things were going. As a reporter usually drawn to lost causes, I surprised myself by saying that things were going pretty well. I arrived half an hour early to the final, fateful city council meeting on Tuesday night, but early was late. There was already a potluck underway in the lobby, full of co-op stir-fries and salvaged baked goods. I ran into a fellow parent from church with her little son and daughter, who unbeknownst to me used to live in one of the co-ops. She told me I shouldn’t wait to go upstairs to sign up to speak in the public comment, which I’d been asked to do. There, an enormous line snaked around the stadium seating—enough chairs for most Tuesday nights but not this one. I joined the end of the line and began talking with the man in front of me, a retired sociologist at my university wearing a colorful knit sweater, who turned out to be the uncle of my aforementioned friend, one of whose tasks in the Marxist commune was to take care of that friend, when he was a baby, on Monday mornings. Before it got to co-ops, the council passed a mainly symbolic measure to declare Boulder a “sanctuary city,” defying the tide of deportations likely soon to come under President Trump. This seemed promising; if co-ops thereafter failed to find sanctuary also, the hypocrisy might cause Chief Niwot to strike from his grave. This time, 88 people signed up to speak at public comment. They got two minutes each. Some organized so as to pool their time as a continuous presentation of charts and figures in defense of the right density limits and resident caps and square-footage-per-person so that affordable co-ops would actually be possible. A few residents spoke of fears about their neighborhoods and their property values; some outright called for lowering the population, for a moratorium on job-creation. But again the vast majority stood in favor, testifying as residents, neighbors and experts to the benefits of co-ops. Again, they said a lot about family. This time, the testimony that stuck with me most was from a resident of Rad-ish Collective, a co-op whose floor once harbored me during a visit before I moved to town. The speaker first clarified their gender pronoun as “they” after the mayor referred to them as “she,” then proceeded to call for triage. Referring to the numerous stories we’d heard of co-ops as places of refuge for those who could afford nothing else, as pockets of economic, ethnic, sexual, and gender diversity, they suggested the council members think of themselves for the moment as doctors. Which case takes precedence—the trauma or the papercut, the property values or the possibility of existing here? Some speakers later, around 11:30 that night, it was my turn to speak, which is worth mentioning only because it gave me the chance to see the council members up close. I don’t think it was solely my remarks on the self-regulating capacities of the cooperative model that left them rubbing their faces, out of fatigue, into such frightening contortions that they reappeared to me when I finally got into bed later that night. The decision finally came through, seven-to-two, at 1 a.m. The co-op ordinance passed, mainly in the form that the Boulder Community Housing Association had been calling for. The compromises necessary for passage still resulted in a list of provisions long and specific enough to risk making impossible the very formations they’re supposed to enable. Just barely, they supported the kinds of co-ops that exist underground in Boulder, while leaving little room for much-needed innovation. But there was some flexibility—200 square feet per person, plus the option for rental, nonprofit and equity co-ops. The cooperators’ victory was complete enough that they might be tempted to think they’d dodged Niwot’s Curse, at least for the moment, and vanquished a demon of affluent-liberal hypocrisy. For their opponents, however, this outcome was the curse’s meaning precisely. Nathan Schneider is a reporter and professor of media studies at the University of Colorado Boulder, and a contributing writer for America.